As a full time Senior Analyst I look at large data sets and build sets of dashboards to answer business questions for our clients. That said, I am also an entrepreneur and I have a "gig" for purchase on a site called Fiverr. People can purchase my "gig", send me their data, and I will build them a dashboard. This gives me an opportunity to work on some pet projects with different datasets. One of those projects was for the Toronto Condo Bubble. 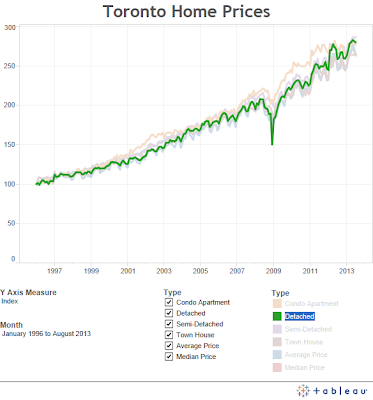 I was asked to create an index of housing prices in Toronto by type of home from January 1996 to August 2013. I added the ability to switch between viewing the price or the index. Additionally, you can use the slider to view specific months. By clicking on the value in the color legend, it will highlight the respective line in the trend above. 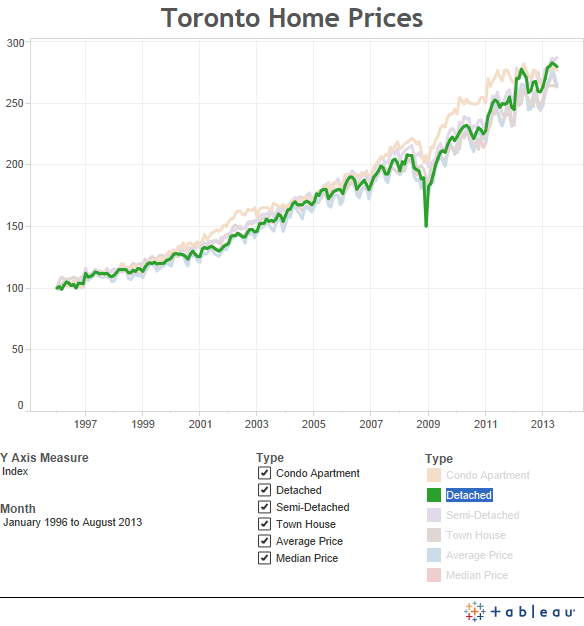 You can view the dashboard live on the Toronto Condo Bubble website, here, or you can check it out below. Yet again, feedback is appreciated!